This update, which we’re calling Emeryville, is focused on improvements to Origin’s underlying software architecture in addition to a wide variety of smaller performance boosts. Taken together, these adjustments improve software performance and stability while also enabling us to make further usability improvements more quickly in future releases. In addition to these foundational improvements, we’ve made some interface changes to improve clarity and workflow convenience. When creating a scan, users are now given the option to use Low Accuracy Scans if they choose (they were previously automatically discarded). 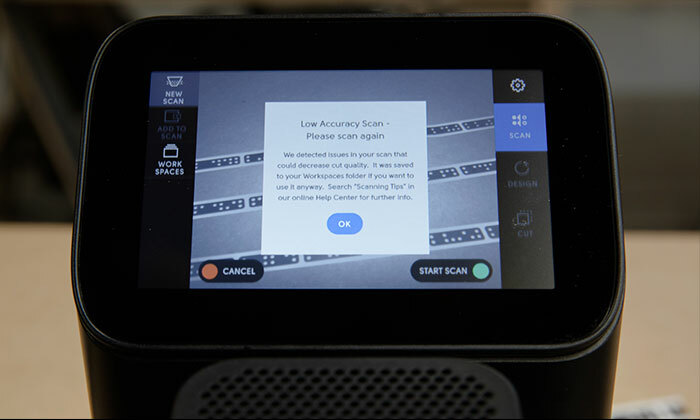 We still suggest that you not use a Low Accuracy Scan on projects that demand highest levels of accuracy, but we want users to have the freedom to make that judgement call on their own. Origin’s keyboard has now expanded to accommodate special characters, and we’ve also included a magnifier tool to improve ease of use. This release incorporates a variety of bug fixes, including a fix for a bug that was preventing a small number of users from logging into their ShaperHub account on Origin. Although many of the software improvements we’ve included in Emeryville might not be immediately visible to users, you will be able to see one obvious change: Origin now supports French (Hi Canada!) and German language selection, as well as region selection. We’ve heard our international fans loud and clear - you want Origin! Adding this multi-language and multi-region support is one of several steps we are taking to prepare to bring Origin beyond North America. If you are updating your software from Dolores (2.4.10.0), this update will provide your first opportunity to use the new download management interface that was added in Dolores. If your Origin is currently running on Dolores software, Origin will inform you that the new Emeryville update is available when you power it on and connect to Wi-Fi. You can choose to install it immediately, or delay the update. If you don’t see that an update is available immediately, just give Origin 5-10 minutes to synchronize with our update server—you’ll see the settings gear icon display a notification bubble when your update has been retrieved and is ready for installation. Once you’ve installed Emeryville and taken it for a spin, let us know what you think in the Community. And once you’ve installed the new software, don’t forget to post your first Emeryville-cut project in ShaperHub! For a complete list of bug fixes and features, see our Emeryville Release Notes.